Blue heelers, also known as Australian heelers and Queensland heelers, are energetic, active dogs, 17-20 inches high at the shoulder, and weighing about 44 to 62 pounds. They were bred in Australia to herd cattle, with an instinct to nip the cattle to keep them in the herd. Although they make good, intelligent pets, they can be suspicious of strangers, and a suspicious, fearful dog, can be apt to bite. The best way to prevent biting is to socialize a dog early so that he or she does not think of strangers as something to be feared. Socialization should begin when your puppy is 8 to 16 weeks old. By the time he or she reaches 4 months, the pup should be able to accept strangers calmly. This does not mean that an older dog cannot be socialized, but it might take more patience if the dog already has behavioral problems, and you might need the help of a good trainer or veterinarian for your Blue Heeler training. 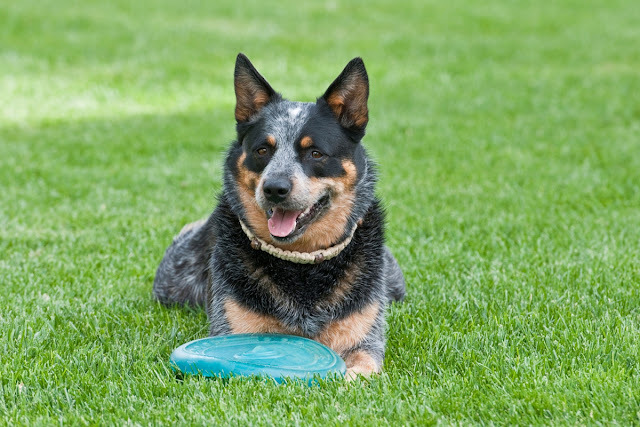 Blue heelers love to go outdoors and run, so good places to socialize them include parks and beaches where dogs are allowed. Put a leash on your puppy early and take him or for a run in the park or beach. When you are both tired, sit down where there are people around and encourage them to pet your pup. When the puppy discovers that strangers are friendly and bring good feelings with them, he or she will be less likely to fear strangers in general. If there is a dog park nearby you can take your pup off the leash and let him or her socialize with other dogs as well as with people. People who go to dog parks are bound to like dogs, so your pup stands a good chance of meeting some friendly people who love to pet puppies. If there are no large parks available, simply walking your Blue heeler around the neighborhood will do you both good and allow you to encounter other strollers. If you take different routes and walk at different times of the day, you are likely to encounter different people and dogs, so your dog will have a continually changing source of new acquaintances. Puppy training classes, or "puppy kindergarten," as it is sometimes called, offer another opportunity for your pup to meet people and other puppies in a safe environment. Your little friend can get used to the trainer, other dog owners, and the trainer as he or she is learning good manners. Another thing you can do is to invite people to come over to the house after you have had a good jog or playtime. This is because if your puppy is tired, he or she is less likely to jump onto people and nip them, which, of course, should be discouraged. Have people sit down and pet the puppy without trying to pick it up, since having strangers reach out to pick it up can be frightening for a young dog. With some socialization, your new Blue Heeler should be well on its way to being calm and able to handle social situations without a problem. Should biting, growling, jumping, or other aggressive behavior become a problem, see a veterinarian or trainer for further advice and dog training. Enjoy your new addition to the family.